When you begin talking about animal emotions, emotions run high. The belief systems that have grown up around emotions are truly amazing. In the past people have denied that animals even feel emotions. They’ll tell you animals may feel pain, but they aren’t really aware that they feel pain. Wait a minute. What are they saying!? That just made my head spin. What nonsense. Clearly these people have never been on a thoroughbred. Thoroughbreds are wonderfully emotional creatures. That’s their charm. They let you know everything they are feeling – the excitement, the fear, the worry, the joy. They truly “wear their emotions on their sleeve”. To say that these wonderful horses are not aware of their emotions is nonsense. With his work on the seven core Affective circuits, Jaak Panksepp has helped bring the discussion of emotions “out of the closet”. Suddenly talking about emotions is the “in” thing. If an animal is being “too emotional”, people will tell you you’re clearly doing something wrong in your training. Wait a minute. What did you say? Too emotional. Words are amazing. They show us our belief systems. Too emotional. What does that mean? One of the roles of a behavioral analyst is to make us think about the words we use. Dr. Jesús Rosales-Ruiz would say we are always emotional. Emotions can be pleasant or unpleasant. You can feel excited and agitated, calm and serene, but they are all emotions. We can look at a particular process, such as extinction. Suppose you have been consistently reinforcing your horse for standing on a mat. He has your undivided attention, so the clicks have been very consistent. But now you’re interrupted. Your friend has asked you to watch how her horse is trotting. She’s not sure if he’s lame. Your attention shifts away from your own horse. He’s still standing on the mat, but now he’s not being reinforced. You’ve just put him into the early stages of an extinction process. While you’re focusing on your friend’s lame horse, your own horse is going through his most recent repertoire of behaviors. What is going to work to get you paying attention to him? He puts his ears forward, he poses, he drops his head, he paws, he nudges your arm. While he’s presenting those obvious behaviors, he’s also experiencing emotions. He’s feeling confused, then frustrated, then possibly angry. If the extinction process continues on long enough, he may begin to feel helpless because nothing is working. Finally, he’ll become resigned as he gives up and settles into a more subdued state of acceptance. Jesús reminds us that ALL processes produce emotions. We tend to think about emotions when they are the size of a five alarm fire, but really we are always “being emotional”. There are emotions associated with ALL behaviors. Ideally in training we’d like to avoid the five-alarm-fire type. That’s why it is so important to understand these processes. The sooner you recognize that you are in an extinction process, the sooner you can do something to get out of it. In extinction the individual (rat, human, horse, etc.) follows a predictable emotional pattern. First, you see response bursting. Here’s what that means: You are observing a rat that has been reinforced consistently for pressing a lever. Abruptly the lever pressing no longer produces the expected result. What does the rat do? It presses the lever with even more energy trying to get it to work. This has been equated with the classic hitting the button over and over again on the vending machine when your coke doesn’t fall out. In the next stage you get angry. Now you’re kicking the coke machine. Next you see regression. Behaviors which have been useful to you in the past reappear. What have you seen modeled? What is your past history when things like this fail? Then there is a pause followed by another period of response bursting. Gradually the cycles become less pronounced. Each phase becomes smaller both in scale and duration until the individual settles into a calmer stage of acceptance. Some psychologists have equated this pattern with the stages people go through when they are grieving. When you lose a loved one, a job, a home, you are thrown into an extinction process. Your loved one is gone. The reinforcers associated with that individual are gone, and your behavior is ineffective. Nothing you can do will change the reality of your loss. The stages of grief begin with denial, followed by anger, then depression, bargaining, and finally acceptance and a return to a meaningful life. It’s interesting to see the comparison people make between the process of grief and the process of extinction. Understanding does bring with it coping skills. If you understand the process you are in, you can keep things in perspective and find a faster way out of the worst of the emotional tangles. You can also be more understanding towards others (horse or human) if they are caught up in an extinction or grief process. When people ask Kay Laurence how she trained a particular behavior, the answer she often gives is: thoughtfully. As we gain more of an understanding of this work, we converge along similar paths. They all lead in the same direction – toward an ever deepening appreciation of others – whatever the species. In the previous posts I looked at the components that go into creating clicker “super glue”. This discussion brings us back to questions, and that’s getting us closer to returning to Poco, the ear-shy horse I introduced you to at the beginning of this unit. There are many threads that weave through my work. What is common to all of them are questions. In the sciences you are trained to ask questions. You aren’t there simply to regurgitate to others what is already known. Your role is to explore, investigate and expand upon what is already known. In archaeology a portion of a site that is being excavated is set aside for a future generation to uncover. The belief is that the methods of exploration will advance, opening up the possibility that more can be learned by waiting for those techniques. The expression: “we are standing on the shoulders of giants” holds true in every field. Sometimes we may laugh at what people before us have believed. We may think, what an absurd notion! How could people possibly have believed that!? But those absurd notions were the stepping stones that brought us to our current understanding. And the beliefs that we hold today are simply more stepping stones taking us to the next “greatest thing since sliced bread”. Creativity is a core driver. We ask questions because we are curious. We want to know what sits beyond the horizon whether that horizon is the physical or metaphorical. We SEEK to know more. Questions can take us out past the horizon line, and they can also take us inside to an exploration of our private space. Here the questions become even more important because we cannot directly investigate these private realms. Panksepp asks questions at the level of individual neurons and the systems that they form within the brain. I have been trained to ask questions at a different level of analysis. That’s a phrase I learned from Dr. Susan Friedman. (behaviorworks.org) Dr. Friedman is a behavioral analyst. She uses a wonderful metaphor of a viewing scope. What is the lens focused on – the distant horizon or something much closer? What is the level of analysis that interests you? My focus is on balance, but I have to go inside to find the answers to the questions I ask. What does going inside mean? If I ask you to raise your arm, I have an overall understanding of how human anatomy works and what muscles, bones, and tendons are involved, but that doesn’t tell me how YOU lift your arm. I could watch what you do, but that gives me only partial information. I could ask you directly, but how many of us know how we do something so basic? We lift our arms without thinking about HOW we are doing it. So if I want to know how YOU lift your arm, I need to ask questions at a different level of analysis. I might rest my arm on your shoulder so I can add the tactile information to all the other data I’m been collecting. I will need to know how to silence all the other answers I’ve gotten from asking similar questions of others. I can’t assume that your answer will be the same as theirs. I ask my questions without knowing the answer. And I observe through questions. Here it lifts. Here it stops. Here her shoulder moves. Here her breath is held. Instead I want to keep putting a question mark at the end of each of these sentences. How is she lifting her arm? Is it anything to do with what I feel under my hands? How does her arm move? Where does the movement begin? Where does the movement stop? Is it the same on both sides? In the horse world many of us are aware of the Feldenkrais Awareness Through Movement method because of Linda Tellington-Jones. Her TT.E.A.M training evolved out of Moshe Feldenkrais’ work for people. Feldenkrais’ work is an exploration of movement in which an individual is guided through questions towards greater self-awareness and well being. Are you telling or are you asking? You can train with a clicker and treats, but if you are telling, you aren’t playing, and you most certainly aren’t listening. Suppose you want your horse to pick up a hind foot. You can use your clicker and treats to “tell” him to do what you want. “Shift your weight over off your left hind.” Click then treat. “Unweight your left hind.” Click then treat. “Unweight it a bit more.” Click then treat. “Pick up your left foot.” Click then treat. “Pick it up higher.” Click then treat. “Hold it still while I clean your foot.” Click then treat. You’ve been polite, but you’ve still told your horse what to do. You’ve picked his foot up, and you’re holding it where you always hold a horse’s foot. But suppose for this horse’s conformation that means his hock is now under pressure. The longer you hold his foot up, the more uncomfortable he’s going to become. He’ll start to fuss and try to pull his foot away. You’ve been told you have to hold on. If you let go, he’ll learn he can pull away, and he’ll never hold his foot up for you. So you hold on. “How do you shift your weight over off your left hind?” Click then treat as he responds with an answer. “Can you unweight your left hind?” Yes. Click then treat. “Can you unweight it a bit more?” Yes. Click then treat. “How do you pick up your left foot?” Follow his movement through the lift. Click then treat. “Can you pick it up higher?” Yes. Click then treat. “Where can you comfortably hold your foot?” Click then treat as you find the spot together. As you ask these questions, you’ll be listening to your horse. You’ll feel how his leg unfolds as he lifts it into your hand. Instead of holding it in a position that stresses his joints, you’ll let him show you where he can hold it comfortably. Instead of fussing, now you have a horse who knows he’ll be listened to. The click and the treat helps to guide him through the questions you’re asking. The questions will give you the lesson. How do I feel it in my hands? Where does the movement begin? How does it begin again? Is it the same on both sides? What changes under my hands? How could it be done differently? Here’s something to play with over the next few days. Put question marks at the end of your training requests, and then make note of the changes you see in your horse. I’ll end with a question. What changes in your relationship as you ask questions and learn to listen deeply for the answers? SEEKING. This is the “granddaddy” of all the systems. You have to find the resources needed for survival. This is why so many people love to shop. The SEEKER circuit is being activated even if you are just window shopping. This system is also activated in conjunction with the other emotional systems so it is too simplistic to say the SEEKER circuit alone was activated. RAGE: Someone wants to take your resources so you have RAGE. FEAR: Other organisms want to eat you, so there’s FEAR. LUST: You need to reproduce. This leads to the evolution of the next system: CARE. CARE: You need to care for offspring. PANIC: The loss of your caregiver and protector triggers this system. This leaves just one more system to talk about and that’s PLAY. After I first heard Panksepp speak, I was trying to remember the seven systems so I could share his work with others. I got six of them without any trouble. What was the seventh? I had a hard time remembering PLAY. Somehow PLAY just seemed too frivolous and inconsequential to belong on this list, but then I started learning more about play and the key role it “plays” in brain development. PLAY: Animals need social engagement which is manifested in play. PLAY is the last system Panksepp lists, and he gives it special significance. It is through play that the neocortex becomes integrated. For a clicker trainer, this list of the seven Affective Systems is of particular interest. Consider what it means to use a marker signal and to pair it with things an animal wants. The click becomes my “yes answer” signal. For the horse it’s a predictor of good things. My horse wants to get me to click so he can engage in activities he enjoys. That means he’s going to be more likely to perform whatever behavior was occurring just as I clicked. It’s a wonderfully reinforcing loop. We’re both happy. I’m getting more of the behavior I like, and my horse thinks he’s got me all figured out! He knows how to make that magic click happen. Clicker training is a fun, effective, horse-friendly way to train. When I look at Panksepp’s list, I understand even more clearly why my horses and I enjoy it so very much. Clicker training activates both the SEEKER and the PLAY systems. I’m not relying on FEAR to move a horse out of my space. In fact I actively work to avoid triggering FEAR, RAGE, or PANIC. As a clicker trainer, I’ve learned how to trigger the SEEKER circuit and to turn training into play for both myself and my horses. At any point where the training begins to feel like a chore, it’s time to rethink what I’m doing. I want to come up with training solutions that don’t just manage my horse’s fear and anxiety. I want to turn the trailer, the farrier, the scary end of the arena into a source of play and social engagement for my horse. I want him actively seeking out opportunities to engage with me and the environment. When I think about Panksepp’s list, I wonder what happens in the brain when different training methods are used. Two trainers could be working towards the same end goal behavior. On the outside you’d see the behavior emerging. But inside the brain – what is happening? Clicker trainers talk about their horses being different. Panksepp’s work seems to support this. When we use clicker training, we’re very much activating the SEEKER circuit. We’re engaging our animals in PLAY, and we’re avoiding FEAR and PANIC. You can train a horse with a whip and spurs followed by a pet on the neck. Alternatively, you can take the threat away and train with a clicker and treats. Panksepp’s work would suggest that very different systems are activated within the brain. And so, yes, when we say our clicker-trained horses are different – at the basic level of brain mechanisms, it turns out that they truly are. So, if play is critical for integrating the neocortex, what is this saying about our animals? And what is the effect on us as we participate in the process? Anyone who clicker trains can easily answer that last question. In the previous section I introduced you to Virginia Morrel’s book “Animal Wise”. In her book Morrell shares the work of scientists from all over the world who are doing pioneering work in the field of animal cognition. That includes the neuroscientist Jaak Panksepp. Virginia Morrell gives a wonderful summary of Panksepp’s work in a chapter entitled “The Laughter of Rats”. It’s a great primer to prepare you for Panksepp’s own books on Affective Neuroscience. For those of you for whom this is a new term, Morrell supplies us with a simple definition: that’s the zone where neurons, emotions and cognition meet. The question here is how does the brain generate emotional feelings and what impact (affect) do these feelings have on behavior? Panksepp sees emotions as evolutionary skills that help animals survive and reproduce. Evolution is a conservative process meaning structures tend to be preserved and reused rather than discarded. We can use mice and rats in medical studies because their biochemistry is so similar to our own. So why should we think the nervous system is any different when it comes to recycling existing structures? Panksepp titled his second book “The Archaeology of the Mind”. It’s a great title. Just as an archaeologist can study past cultures by digging down through layers of sediment, the neuroscientist can study the evolution of cognition by going down through the layers of the brain. We share the same ancient structures with all other species of mammals. We are not separate from other animals. We share a common heritage, and Panksepp now has evidence to support the idea that that means we also share common emotional experiences. By electrically stimulating the brains of rats and guinea pigs Panksepp has identified seven emotional systems found in the mammalian subcortex. These seven systems serve similar functions in the animals he has studied. When he talks about these systems he writes them in capital letters to differentiate them from our vernacular use of these terms. I will follow this practice here. The SEEKER System is the most primitive and extensive of the seven systems. The SEEKER circuit is activated when a healthy animal explores it’s environment. It needs to know where it’s resources are, where to look for food and water, shelter and mates. When people talk about the SEEKER circuit, they often use someone’s love of shopping as a modern example of this system in action. Karen Pryor has speculated that the SEEKER system is activated by clicker training. That’s why we see such enthusiasm and eagerness to engage in the training. It isn’t so much about the food that comes after the click, as it is the hunt for the right solution. It’s easy to see how the SEEKER system applies to dogs and other predators. They have to hunt for their prey, so it’s no wonder dogs love clicker training. But horses? They live on a carpet of grass. How does this relate to them? Even horses need a strong SEEKER System. They may live on a carpet of grass, but they still need to find the bits that haven’t been recently grazed. They need to know where the water holes are, especially in a dry climate. They need to know where to find shelter in a storm, and what the best routes are out of a canyon should they be chased by predators. I came to appreciate the SEEKER system in a rather odd way. I don’t know about you, but I am a mouse rescuer. When one of my cats comes parading past me with a mouse or baby rabbit dangling out of her mouth, another of Panksepp’s primary systems sends me into action. The nurturing CARE system makes it impossible for me to see an animal in distress without wanting to do something about it. Yes, I know mice are considered pests and all that, but mice also have emotional lives. They are amazing creatures. I’m going to digress for a moment. At the new barn we use an O2 composting system for the manure. Instead of creating a large manure pile somewhere – hopefully out of sight – and leaving it over a period of a year or more to rot down, manure goes into a cement bay. When the bay is filled, a pump forces air through the pile. You can see how this is done by looking at the photo. The empty bay in the middle shows two rows of wooden slats. These cover a trough in the floor. Air is pumped into this trough and up into the pile through holes drilled in the slats. This not only speeds up the composting process, the intense heat from the rotting manure kills weed seeds, insects and parasites. In three months it can produce a high quality compost that can go directly back onto the fields as fertilizer or into the garden. And because the manure is contained throughout the process in the cement bays, there’s no unsightly muck heap in the barn yard. We don’t have a tractor so when a bay is ready to be emptied, I do that by hand – wheel barrow by wheel barrow. It’s a time consuming process but well worth the effort. As I shovel in yet another wheel barrow full of compost, I think of the flowers that will be growing out of it later. One cool fall day I was emptying the composter, digging in with my pitch fork when I disturbed a mother mouse and her nest filled with babies. She scurried out from under my pitch fork with seven almost-grown babies clinging to her belly. She ran up what was for her a mountain of manure to the top of the composter. There she was confronted with a sheer cliff many times higher than herself. One of her babies had lost it’s grip. She paused just long enough to give it time to reattach itself to her belly, and then she scaled the cement wall, ran across the wooden planks of the walkway at the back of the composter, and disappeared into the safety of the mouse tunnels she must have known she would find on the other side. I was in awe. What courage. Am I projecting human emotions onto a mouse? Maybe. But I will still call it heroic what she did, especially pausing long enough to carry all of her babies to safety. She could so easily have left that one behind to save the others. She could have kept herself safe and simply abandoned them all. We have much to learn from the dedication of that little mouse to all of her offspring. So when one of my cats come meowing proudly through the house showing off some little mouse that she has brought back for me, I turn into a rescuer. But I am always in a quandary. I hate the way a cat will play with a mouse before she kills it. I want to rescue the mouse and set it free. But am I really doing it a favor? Who knows how far the cat has come. When I release the mouse, will it be able to find it’s way back to the safety of its nest, or am I condemning it to a slow death by starvation? I always do rescue the mouse, but for years I worried if this was really the best thing to do. And then at one of my clinics I got the answer. During our Friday evening introductions, one of the participants said he was a field biologist. He looked the part. I could easily see him tromping through the woods of northern Minnesota, radio tracking equipment on his back, following a pack of wolves. I’m sure you can conjure up your own picture based on all the nature programs you’ve watched on TV. I asked him what species he studied. His answer: mice. Hardly. It turns out he loves mice. He was studying an endangered species that lives in the coastal sand dunes of North Carolina. Here was the perfect person to ask about my dilemma. Was I doing the mice I rescued any favor. I was very much delighted to hear that, yes absolutely, the mice would know how to orient back to their nests and stored food supplies. It turns out mice can travel huge distances over the course of a single night. They are updating the map of their territories. They need to know where their resources are. Where is the grass that is about to seed, the berries that are about to ripen? Hearing this gave me a much deeper understanding of the SEEKER system and the primary role it plays in an animal’s life. In the next installment I’ll continue to explore the Seven Affective Emotional Systems identified by Jaak Panksepp. Next up is RAGE. 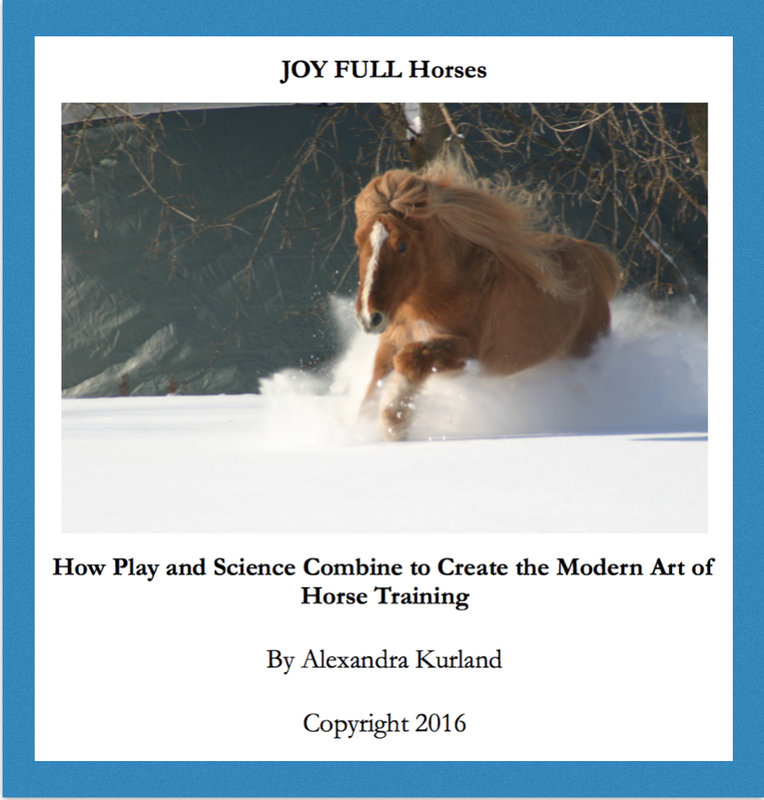 JOY Full Horses: Part 1: Why Play? I’ve teased you with an introduction to this book, and with the Table of Contents. Now finally here is Part 1: Why Play! This is a short section – just to get your feet wet. Enjoy! they become indistinguishable from play. When you travel by plane as often as I do, you begin to know all the major airports in the country. I can tell you which ones have free internet access and electrical outlets at your seat, and which ones force you to sit on the floor to recharge your computer. I can tell you which airports have decent food and which ones assume that the entire traveling public wants to eat junk food. I can also tell you where all the good bookstores are. I enjoy browsing through airport bookstores. Instead of feeling overwhelmed by an overabundance of choice in the mega bookstores, the airport bookstores are confined to cubbyhole spaces. They give you just a small sampling of what is current and popular. What I want for traveling is what I call airplane reading – nothing too heavy. I mean that both physically – I may have a long walk between gates and my backpack is already weighed down with my computer and camera equipment. And I also want something that’s light enough reading to let me dip in and out as I nap on the plane. I often check out the business and science sections where I’ll find titles that might not otherwise have crossed my radar. That’s how I spotted a book on play, called appropriately enough “Play”. For a long time, whenever I referred to this book, I could never remember the author’s name. I finally tracked down my copy for the express purpose of being able to reference the author in a talk I was preparing. It was written by Stuart Brown. Stuart Brown. How was I going to remember that? Stuart is easy. Stuart is Stuart Little from E.B. White’s charming children’s book. And if we are thinking about children’s books, then, of course, we have Paddington Bear, and that gives you the author’s name. Not sure of the connection? Paddington Bear lived with the Browns. Hence Stuart Brown. That’s a playful way to remember the author of a book on Play. Stuart Brown is an M.D. who has studied play. In his book he posed an interesting question. Play carries with it enormous metabolic costs and genetic risks. Two horses playing mock stallion battles are not only expending a great deal of energy, they are exposing themselves to possible injury. In the wild if they miscalculate and one of them is injured, that horse could very quickly be out of the gene pool. So given this, why is play so prevalent? It’s not just people and puppies who play. You’ll find play behavior across all species of mammals. It’s not my intention here to give a detailed review of Brown’s book. The main point he was making is that regardless of the evolutionary forces that led to the prevalence of play, what we are left with is this conclusion: play is important for the development of healthy brains. When you compare brain scans of individuals who have been play deprived with those who are living in enriched environments with many opportunities for play, you see a marked difference. Should you wish to, I’ll leave it to you to explore this in more detail. You can begin with the lighter read of Brown’s book and then move on to the work of neuroscientist and play specialist, Jaak Panksepp. And if you want even more, their books will give you plenty of additional references to explore. The launching point for what I’ll be covering is this basic premise: play is important for healthy brains. That means it is important for our horses, and, equally, it is important for us. As I explore what play means in the context of training, I will be focusing my attention on both ends of the lead rope. I’ll be looking at what it means for both the horse and the handler to be engaging in play. Bob Viviano and Crackers – Great partners who knew how to play and to share their connection with others. When we think about clicker training, we often think about play. After all, we’re often using clicker training to teach some very playful behaviors. But just because you are having your horse kick a beach ball, doesn’t necessarily mean either one of you is having fun. If you’re so caught up in the science behind the training, if you’re thinking about what the discriminative stimulus is for kicking the ball and whether you should be using a least reinforcing stimulus after that last miss, your brain may be processing the interaction in a way that’s a long way away from play. If you’re concentrating on your handling skills, if you’re thinking about the timing of your click, and whether your hand is staying out of the treat pouch between clicks, again you may be a long way away from play. It’s easy to get so caught up in “getting things right” that play drops out of the equation. The function of these articles is to remind you that we need to keep bringing play back to the forefront of our training. I mentioned Jaak Panksepp earlier. His work is getting a great deal of attention at the moment within the clicker community. Karen Pryor gets the credit for this. Karen Pryor is one of the very early pioneers in clicker training. Her book, “Don’t Shoot the Dog” has introduced thousands of people to this modern form of animal training. Karen wanted to know what the neuroscientists could tell us about how the click is processed in the brain. In her book, “Reaching the Animal Mind” she talked about the SEEKER system, one of the seven primary emotional states Panksepp has identified. It is the SEEKER system that Pryor attributes to the enthusiasm and – dare I say it – joy we see in our clicker-trained animals. “Animals have minds. They have brains, and use them, as we do: for experiencing the world, for thinking and feeling, and for solving the problems of life every creature faces. Like us, they have personalities, moods, and emotions; they laugh and they play. Some show grief and empathy and are self-aware and very likely conscious of their actions and intents. Hurray! Finally people are coming around to my view of animals as intelligent, very aware beings with rich emotional lives. I know this goes against strong cultural biases. But where did this notion that animals do not think come from? Why do scientists have such a horror of being accused of being anthropomorphic (attributing human mental abilities to an animal)? How can we deny the evidence we see in every interaction we have with our horses, with our cats and dogs? Morrell points out in her introduction that this idea that animals do not think or have emotions as we know them is an old one. Aristotle did not believe that animals could think rationally, but he did at least grant that they experienced physical sensations such as hunger and pain, and they could be angry. Belief systems are a curious thing. There’s that wonderful line that crops up during political discussions: you wouldn’t want a little thing like facts to get in the way of a good argument. It applies here, as well. Belief systems become self supporting. We tend to attract experiences that support our belief systems. I find it beyond comprehension that anyone could deny the emotionally rich life that animals have. You have only to sit on a panicked horse who has been separated from his herd to know very directly the emotions he’s feeling! But I suppose there will be those who would say I’m just delusional. I’m the one attracting evidence to support a faulty belief system. Perhaps. But I am no longer alone. If you want a good read, add Animal Wise to your list. Morrell has been visiting with scientists from all over the world who are doing pioneering work in the field of animal cognition. That includes the neuroscientist Jaak Panksepp.